The ever-changing gunas. Americosmos courtesy of Darrin Drda. Summary: This is part 9 of a 10 part essay that suggests we can think of science as a weak form of samadhi. 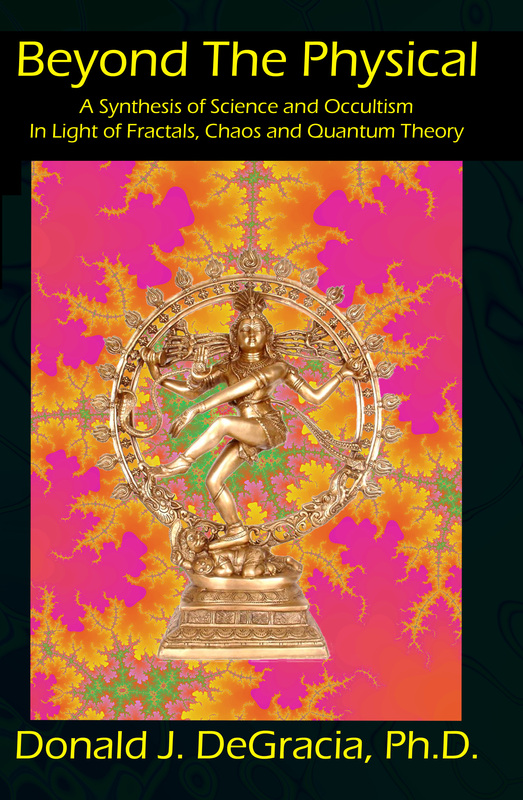 Here we introduce yogic cosmology as the means to understand how science and mathematics describe the natural world. Yoga and science each have their own methods for reaping knowledge from the world. By understanding these differences we come to understand science in a new, and deeper light. That is, after all, the purpose of this essay, recalling its title is: What is Science? The difference can be summarized thus: science skims the surface of the world to acquire knowledge. Occasionally, via this skimming process science plumbs below the surface in an irregular, haphazard and unsystematic manner. Science is like Brownian motion; movement that may momentarily appear to have purpose, but is without direction when viewed over the long term. Yoga dives beneath the surface and into the depths of the world. It does so systematically. Yoga does not stop at any particular depth below the surface. Yoga goes all the way to the center of the world, and thus acquires ultimate experience. It is the ability to contrast experience at the surface of the world, which is the condition of relative becoming, and the experience at the center of the world, which is the condition of absolute being, that allows yoga to shed light on this activity we call science. Because yoga seeks to silence movement, vrittis, in the mind, it is acutely concerned with how the senses function. This is in contrast to most sciences that take for granted that the objects as presented by the senses can be taken for granted. Yoga offers an elaborate integrated scheme of the effect of the senses on the mind, and the relationship between the senses and the objects of perception. Yoga not only understands sensation in terms of the mechanics of sensory contact with external objects, but looks much deeper at the effects of sensory input on the mind. The effects of sensory stimulation percolate through and grow within the mind, something like weeds in dirt, forming very complex mental and emotional structures. 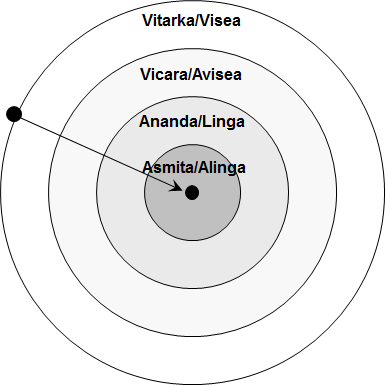 These are composite structures of sabda, jnana and artha, as discussed previously. Let us look at the sensory processes that give rise to these complex vritti structures in the mind. Our modern understanding of sensory physiology is consistent with the yogic understanding. The senses interact with objects by, for lack of a better term, bouncing off objects. No direct contact between senses and objects ever occurs. Vision is caused by photons emitted by or reflected off objects. The photons are a middle man between the object and senses. Hearing, like seeing, is mediated via sound waves acting as middle men. Touch is perhaps the most paradoxical of sensations. With touch, it appears as if we make contact with the object. But physics teaches us that the interaction is the microscopic repulsion of electron clouds generating inertia at the macroscopic level. Thus, touch is repulsion between the sensors and the object; touch is the exclusion of the object from the senses. Taste and smell are perhaps the most intimate of the senses because microscopic pieces of the object enter the mouth and nose, respectively, and mediate a touch-like interaction at a molecular level. Again, however, the essential forces involved are those of the repulsion of the electron clouds of the odorant or tactile molecules with the receptors. And more importantly, what is conveyed by taste and smell are pieces of the object that were expelled from the object. Thus, via this “bouncing off of” action of sight, hearing and touch, and to a lesser extent smell and taste, the senses reveal only the surface of external objects. Neuroscience therefore confirms the yogic insight that sensation is a non-contact phenomenon. The emphasis in yoga that sensation is a form of non-contact with the objects of perception derives via contrast with the experience of samadhi, where there occurs a literal fusion of the object and the observer. They are opposite extremes in a spectrum of knowing: contacting merely the surface of things by a “bouncing off of” process, as opposed to actually becoming the thing. The senses become “excited” due to being repelled by objects and convey this excitation into the brain. In the brain, extremely complex patterns of electricity are generated. In turn, the electrical patterns generate vrittis, waves, dynamical patterns, gunas (choose your favorite term, they are all the same) in the mind. It is the vrittis that constitute the elements of direct, first person awareness. We are therefore only directly conscious of the far distal effects of sensory activity that occur at the end of a long chain of complex events. The patterns in the mind reflect only the surface of the object and none of its interior. Even if we cut a thing open to inspect its interior, we encounter only new surfaces. And so it goes all the way down to quarks, and all the way up to the largest scale galactic structures. “Things within things within things within things” is the end result of sensory perception. 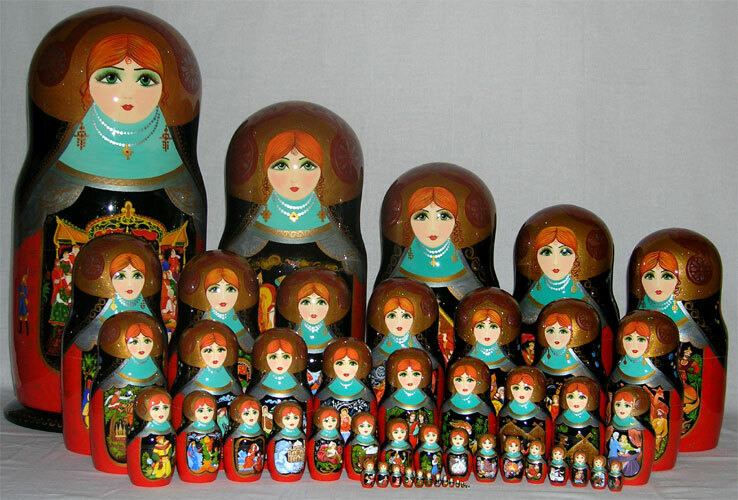 The mind only knows surfaces within surfaces within surfaces, like the Russian nested dolls. The structure of the world. What we are aware of in our minds are dynamic patterns (gunas) that create mirages of solidity at more macroscopic levels, but dissolve into only motion when intensely scrutinized. As discussed in Part 4, the yogic theory of knowledge sees all thinking in the vikshepa state as a composite of sabda, jnana and artha. To briefly review: Sabda are the arbitrary symbols associated with external events and (seeming) objects. Jnana is empirical knowledge: the mind shaped by sensory events and the associated thoughts. Artha is the true essence of a thing. It was claimed previously that science works by eliminating sabda and extracting jnana from sensory consciousness. Let’s illustrate this process by example. Consider the idea of gravity. Of course we see things fall down all the time. That is the sensory fact. We also see stuff move in the night sky. That is also a fact. We now know that both sensory experiences are the result of gravity. But it wasn’t always so, and this idea has undergone a few major transformations over the past 2000 years. First was Aristotle, who thought that falling down was an attribute of things that fall down. This idea did not allow him to link movement on Earth with that of the heavens. It also prevented him from seeing gravity as a thing it itself. Aristotle’s view was our forerunner of the idea of mass or inertia, but it was blind to the idea of the gravity force as a thing itself. Newton recognized there were really two things going on: there is mass, which has the potential to fall, and there is a force that acts on mass, gravity, that actually makes things fall. Newton therefore linked sensory experiences on Earth and the heavens. He made an equation for this and it all seemed settled, even though people, including Newton, did not like “spooky” action at a distance. A couple hundred years later, building on the work of hundreds or thousands of people, Einstein saw a new way to link gravity and mass, and radically transformed Newton’s force into the bending of space-time in General Relativity. We know today that Einstein’s view cannot be the whole answer because it cannot be reconciled with quantum mechanics. Physicists are currently working very hard to find the next theory of gravity. Let us dissect this process in yogic terms. First there are the sensory experiences: the perceptions of things falling down, or moving in the night sky. By itself, sensation means nothing and must always be interpreted by the mind. The sabda aspects are the words and ideas used to explain the sensory experience. Jnana refers to the progressively accurate correspondence between the words and ideas, on one hand, and the sensory experiences on the other. Aristotle was not wrong; he just didn’t have the whole picture. The same can be said for both Newton and Einstein. We thus see a progression where the meaning, the understanding, more accurately reflects what the senses had been conveying all along. So, jnana refers to those meanings in the mind that accurately correspond to sensations. What of artha? The artha is also a form of meaning, but of a different quality. Aristotle’s idea didn’t have much artha in it. Its main power was to propel other people to keep wondering why things fall. But Newton’s ideas actually tapped into artha, because now, the meaning could be used to extract power from the world and to cause rational changes. Newton’s ideas gave us superpowers. Einstein’s ideas tapped even deeper into the artha of gravity. A whole new level of power could be extracted, as Hiroshima and Nagasaki found out the hard way. Compared to sabda and jnana, artha is very hard to intellectually characterize. It is meaning that allows the release of power from the world. That is the easiest way to say it. But to state exactly the characteristics of this meaning is probably impossible, though we will attempt to do so in the next section. There is an important feature of science that our single example illustrates. We are forced to always update our notions of objective reality in science, even in deductive sciences like physics, let alone inductive sciences like biology. Similar stories as above can be told for every science. In fact, it is the cultural norm of science to expect that all ideas are tentative and that, tomorrow, something can come along and completely transform our understanding of any part of the world. It is ironic: scientific culture accepts tentativeness and rejects the possibility of certainty, yet is poised to forever seek such certainty. What do you find when you try to catch the wind? Artha is beyond the intellect. In Part 8 the irony was pointed out that even though true scientific activity results in limits, it is through those limits that power is released. In a very indirect and oblique way, the whole history of science is Kant’s program to define the limits of reason. The limit theorems of science are the limits on reason forced on us by the input of our senses. What is a limit? It is something that cages and confines. A limit stops movement. Now, I will use the world limit in another sense also, in the sense it is used in calculus. We can speak of the limit of 1/x as x goes to infinity. In this case, the limit is zero. Consider this: what would be the (calculus) limit if all limit theorems were known? Knowing all the limit theorems would stop the mind from moving in all arbitrary directions. The limit of all limit theorems would be perfect knowledge. At this limit, the mind would not even move at all. It would be a state of perfect equipoise, like a balance on a razor’s edge. It would be yoga. A crucial ingredient in the development of Western science and technology is the marriage of science and mathematics. What do we see in the progression of Aristotle → Newton → Einstein? We see the progressive reliance on math and the decreasing reliance on the senses. Aristotle used no math and his ideas released very little power, if any at all. Newton’s math was grounded in sensory perceptions: apples falling, planets making trajectories through the sky. Nonetheless, power was released from his ideas. Newton was part of the genesis of the industrial revolution. By Einstein, the senses are pushed out of the picture. No one has ever had a sensory experience of riding along a light wave. Like Mickey Mouse and Unicorns, this existed only (initially at least) in Einstein’s imagination. 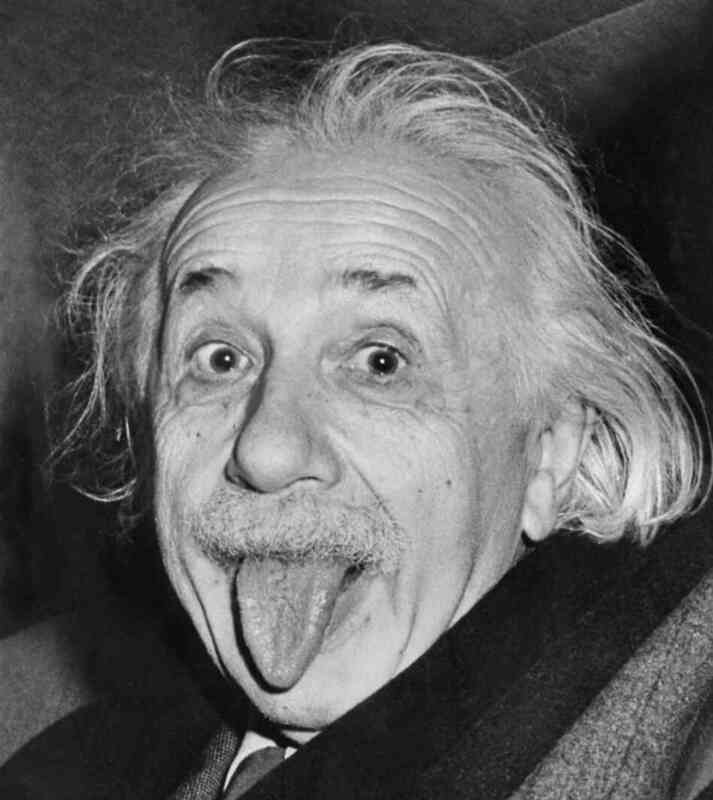 But he was able to translate these musings into math and invent his Theories of Relativity, and again, for the umpteenth time, much power was released. We hit here on a very crucial point that has not gone unnoticed to the Western intellect: What is this “unreasonable effectiveness of mathematics”? This question also leads to serious irony. Science is thought of as hard-nosed, as sticking to facts, which means sensory experience. Yet, time and again, the senses fail. And who picks up the slack? Mathematics does. But what is math? Math is a specific type of thought occurring in the human imagination, which we define more precisely below. But, unlike fiction novels, Hollywood movies, and unicorns, these imaginary thoughts have a direct correspondence to sensory experience. From the Western intellect’s point of view, there are many answers to this question, which means nobody knows the right answer. Right now, today, people who think of this issue are awe struck, and mostly confused about it. Consider an extreme example. Max Tegmark, a professor of physics at MIT, has been promoting the idea that math works because the physical world is a mathematical object. This is just plain silly. The physical world is definitely not a mathematical object, and not many people take Max seriously. But Max’s efforts are useful for illustrating the extreme confusion that plagues the Western mind. He is, in fact, one of the honest and confused scientists working at the intersection of mind and matter. Can yoga help us understand why math is so effective at releasing artha in the world? Yes it can, but we must learn some more technical yogic ideas first. Previously I pointed out that yogis do not learn samadhi to know things, but learn samadhi for a different purpose. The purpose is to dive into the depths of consciousness; to go from the outer surface of sensory experience to the center of being, where all existence converges. From this experience emerges a cosmology, yogic cosmology. By understanding yogic cosmology we can directly answer the question of why math is effective for describing the natural world, and some other questions that I have avoided answering so far. These aphorisms are a BIG DEAL. A whole cosmology is described in two sentences. The aphorisms describe the entirety of the external world and the corresponding levels of mind. Both the external world and the mind are described to consist of four distinct levels, phases, or states. I will use the term “state”, in an analogous sense to how we speak of a “state of matter” such as solid, liquid and gas. What is the four-fold cosmology of yoga? This now gets us into Unknown Territory for the typical person. According to yoga, the world we perceive with our senses is only one of four co-existing worlds. When one shuts out the world of sensory experience via pratyahara, it is discovered immediately that there are other layers of conscious experience beneath or within the one we are experiencing right now. The other three worlds are altered states of consciousness. In fact, the yogic cosmology is the map of the possible altered states of consciousness. It is comprehensive. There is no state of consciousness not contained in the above table. Talk of altered states scares some people. But it need not. 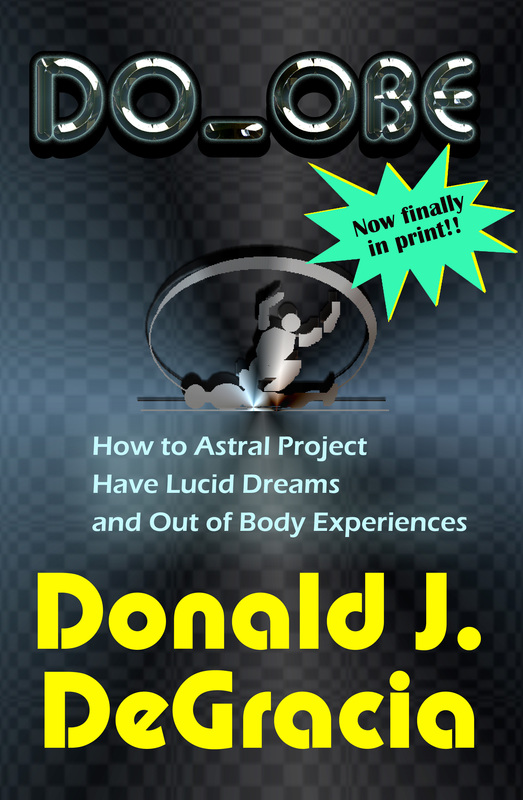 All of us have some minor experience with altered states and we call it “dreaming”. When we dream at night, we have transferred our consciousness out of this world and into the adjacent world, called “avisesa”. So, if one is scared by these concepts, go work in a factory or retail sales. You have no business in intellectual matters if you cannot handle it. As the diagram above indicates, the world, existence, Nature, whatever you want to call it, has four levels or states. These states are depicted as concentric spheres, one within another. 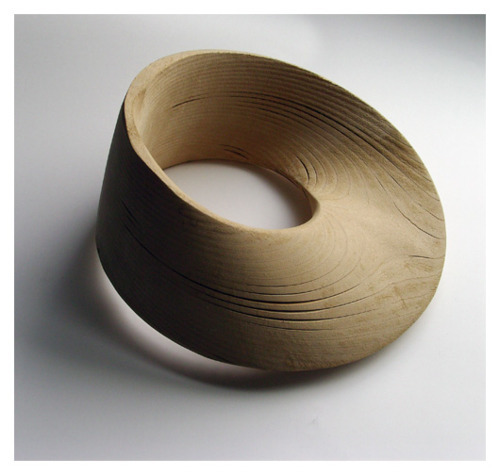 This concentric arrangement represents the inward descent into the depths of consciousness effected by samadhi. The four states of consciousness listed in the table above are the four sub-types of samprajnata samadhi (samadhi with a seed) as defined in aphorism 1.17 above. The worlds and corresponding states of consciousness listed above are the empirical categories of consciousness discovered by yogis. These are not mere philosophical ideas. Again, they are operational. They are the terms required to describe yogic experience. In yogic cosmology, the world is a much bigger, and much more abstract place than it is in modern scientific cosmology. I’ll now briefly describe the four states of matter and mind. The outermost state is called visea and the corresponding consciousness is called vitarka. In short, this outer level is the state of consciousness we are in right now in the world of waking experience. The world of visea is the world we perceive with our senses when awake. All the discussion above about surfaces and such was describing vitarka consciousness in the world of visea. Visea/vitarka is perhaps most informatively translated as “specific instances of”. The visea world is the world of specific people, specific trees, specific planets, specific stars, specific universes, etc. You get the idea. The corresponding state of consciousness perceives these as relatively autonomous objects. But in the world of waking, full of seemingly endless objects, what are these objects specific instances of? They are specific instances of generic archetypes. Avisea means “lacking specificity” or “generic”. Vicara means “synthesis”. Where vitarka consciousness perceives a field full of specific roses, vicara consciousness perceives only the general property of “rose-ness”. Vicara consciousness perceives the various archetypes only, and not specific instances of the archetypes. The world of vicara is the world of archetypes. The corresponding consciousness is one of “synthesis”, or more informatively, of “generic-ness”. NEWS FLASH for the Platonist mathematicians: Plato’s world of mathematical objects actually does exist and it is the avisea realm discovered by yogis. In fact, the avisea realm is the realm of the mind in the dream state. Dreams convey archetypes as meanings, as Carl Jung recognized. This is why dreams make so little sense from the waking standpoint. Dream perceptions convey a different type of information than do the sensory perceptions in the waking world of visea. The waking mind of vitarka interprets dreams in terms of specific instances when in fact the information conveyed is that of achetypical qualities. But there are many archetypes (infinity actually) and they are entwined in endless complex patterns. The world that reveals how the archetypes interlink is the world of linga. Linga means “marked”, as in putting an identifying mark on something. By “marked” is meant that the archetypes are distinguishable from one another, in spite of the fact that they are hooked together into patterns. Perception of this world is called “ananda”, bliss. Relationships of the most abstract character occur in consciousness at this level. To perceive at this level is bliss beyond anything possible in the waking state. This bliss is very feebly reflected, for example, in the beauty and elegance people feel when seeing good mathematics. However, the understanding experienced here far transcends any understanding of the intellect in vitarka consciousness. This level intrudes into vitarka consciousness via intuitions of Heavens and Gods, the great myths of Humanity, the desire to unify all knowledge, and other such insights. Finally, although the archetypes hook together in the awe-inspiring and mostly incomprehensible patterns, in the final analysis they fuse to form one thing: the totality of existence. The Greeks had a word for this: logos. The Divine Plan. The Divine Plan has many pieces. The many pieces are seen directly in vitarka consciousness as individual beings, seen in vicara consciousness as archetypes, and seen in ananda consciousness as patterns of archetypes. But the Divine Plan itself is just one unified thing. When the Plan is seen in its totality, the various pieces of it are “unmarked”, they are “Alinga”. The corresponding consciousness, asmita, transcends even the bliss of ananda consciousness. No words can explain; which is why I wrote a poem about it. That, in a nutshell, is the Universe discovered by Yoga. Here a few comments are made about this cosmology. First to be noted is that concepts of an external world go hand in hand with states of consciousness. There is no dichotomy here; each world is identical with a specific state of consciousness. Further, the scheme is all-encompassing. There is nothing one can think that is not within the map. A smart person schooled in the Western view of the world should, if you really understand what is being said, feel stupid and embarrassed in the face of this cosmology. Second, as seen in the above descriptions, the yogic view of the world, what they call manifested existence, has the general form of going from the general to the specific as you move from the center outwards. It is a common sense way to organize thinks when you think about it, although the idea has not occurred to western science. Western scientists look for specific things, like energy, or information, or entropy, or symmetry, or some such archetype to ground a “theory of everything”. But the yogis discovered that the universe is naturally arranged such that the absolutely most general thing, pure being, becomes progressively more specific and differentiates into an infinitude of specific beings at the periphery. Taimni spells this out in a useful way by calling it “differentiation”, with some allusion to the calculus function. He compares it to passing white light through a prism. The colors are latent, or potential in white light, but a mechanism is required to manifest them. Dispersion breaks the unified white light into its differentiated component frequencies. It is a simple metaphor but it captures the idea of going from the general to the specific, from the unified to the diverse, from the One to the Many. Third, review Aphorism 2.19 above. 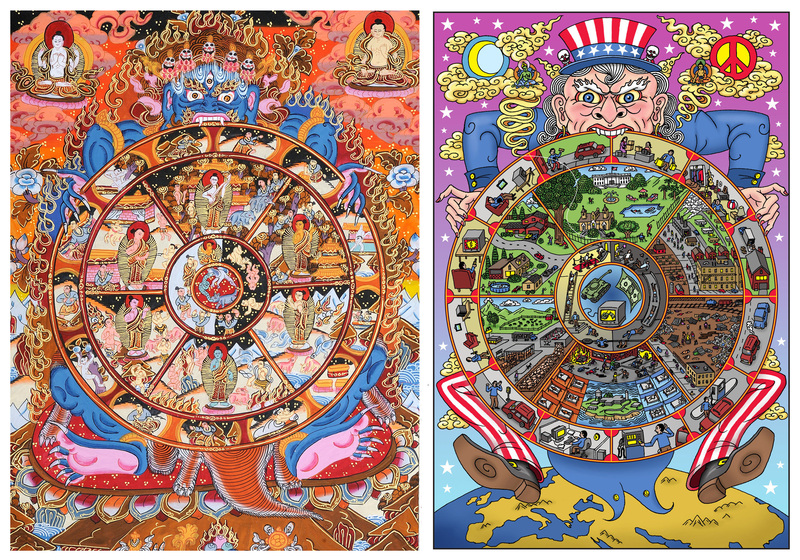 Notice the last two works are “guna parvani”, meaning the “states of the gunas”. This, to me, is the most remarkable aspect of the yogic cosmology: it describes dynamical patterns. Period. Nothing else. All states of consciousness, all external worlds are nothing but movement. In each state, the mind/body dichotomy is handled identically: both mind and matter are gunas. They are of the same “stuff”. Therefore there is no dichotomy. This is what I meant when I said, “The Hindu mind is literal and material in a fashion far beyond the Occidental imagination”. The four states of gunas are all worlds of matter, but only the outermost is material in the sense the Western brute mind understands. The inner realms are solely mental, and in fact transition into worlds of spiritual “stuff”, spiritual matter. To the yogic mind, Gods and Heavens are as material as the ground under your feet. They are all only gunas. It is all only movement. Finally, to add the cherry to the top, none of this matters to a yogi. The cosmology of yoga is provided by way of the instruction: “this is to be avoided”. There is one state not described in the above scheme. It is not really a state. It is something altogether different, but this “thing” is the only goal of yoga. The “thing” is called Kaivalya and it corresponds to consciousness at the very center of the circle. Discussing Kaivalya is not relevant to the present essay. We include it for completeness sake. All the power, all the artha released in yoga has only Kaivalya as its goal. To the yogi, the four worlds of matter and movement is all a giant distraction. It is Prakriti, the gunas, the Maya. It is all “… a tale told by an idiot, full of sound and fury, signifying nothing”. So now, with yogic cosmology under our belt, all the problems we have raised can be solved. As we have seen, yoga solves the mind-body dichotomy by formulating these merely as patterns of the gunas. Other problems we have raised are solved in a similarly straight-forward manner. Math works because the four worlds permeate each another. Events in one world affect events in the other worlds. Each of the four worlds are sources of vrittis. As such, to the yogi they need to be silenced (yogah chitta vritti nirodhah). But to everyone else, the four worlds interpenetrate. We access all four in our minds all the time, whether we are aware of the fact or not. The impact of each world (realm or loka) in the conscious mind is a difference of scale. It is, in part, an intensity issue. When we are in vitarka consciousness, it overwhelms us, just as, during the day, the sun’s light overwhelms our vision and we cannot see the stars. Similarly, the gunas of visea mostly drown out the gunas from the other three worlds. It is also an issue of “rate of vibration”. Just as a UV detector cannot detect x-rays, the minds of most people are tuned only to interpret the crude gunas of vitarka consciousness. They have not trained their minds to detect the much finer vibrations imparted from the three inner layers. So, although the vibrations are present, they are invisible, just as x-rays are invisible to a UV detector, even if present. Mathematical insight is nothing more than perceptions of avisea and linga breaking through into waking consciousness. Some people are more tuned to receive the subtle mental ripples generated in the mind by these worlds. When coupled with the right training of the mind, we call such people mathematicians. The vrittis from the deeper layers that enter the consciousness of mathematicians are the patterns of archetypes and their relationships. Mathematics is a specific form of sabda that allows an accurate expression of these patterns and relationships. Mathematics is Western civilization’s version of Nada Yoga, the yoga whereby patterns in sound and symbols match reality. Next, we ask, how it is a yogi can get true insight about a supposedly objective thing when mediation occurs only in the mind of the yogi. The answer should now be obvious. All true insight comes only from the mind in the first place. As is well-known, the senses are generally unreliable guides to discern truth. Input from the deeper layers always accompanies sensory input. People we call “geniuses” are those with the right combination of sensory perception, and attunement to the deeper layers, and also in the right place at the right time (which is called “karma” and a topic for another long essay) to make a substantial contribution to the social activity we call science. So, what the normal scientist does and what the yogi does are not all that different when seen from the view of yogic cosmology. Both tune into the deeper worlds and get perceptions of things at those levels, perceptions that are generalizations of the specific things experienced by vitarka sensory consciousness. However, the yogi does this with infinitely better precision. First, they are trained to do so, and second, their actions are informed and guided by yogic cosmology. The normal scientist, even of the most genius caliber, must always fight against the resistance and noise generated by multitudes of vrittis unrelated to science reverberating in their mind. The methods of yoga that silence the vrittis in a systematic and progressive fashion, will, to use Patanjali’s term “clarify memory” so the only thought in the mind is of the desired object. Furthermore, as previously discussed, the pratyaya is stripped of sabda and jnana. When only artha remains, there is no interference, only a straight-line run to the center. The pratyaya is found to be only some pattern of movement, pattern of gunas. This pattern is akin to a “cosmic address code” for the object as a thing in itself. Via this “address code” the yogi is able to sink to the center of consciousness and fuse with the consciousness that is the being of the object. In our vikshepa state we cannot experience samadhi, but we can compare it to things we do experience and gain some small insight into this state of consciousness. There are two things we can compare it to: (1) mathematical insight, and (2) our own existence. One on hand, samadhi is akin to mathematical insight in that it is a purely mental phenomenon that can reveal truth. But the svarupa of the pratyaya is more abstract, complex, and contains movement. Imagine the physical sound waves associated with a song, such as Beethoven’s Fifth Symphony, or The Beatles’ Tomorrow Never Knows. Then imagine you can comprehend the wave patterns of the whole song as one whole object. The time sequence would merely be cross-sections of this object. This gives some small sense of what a svarupa “looks” like. Most important, the perception of the svarupa of the object as an external is only a phase in the process of samadhi. Ultimately, the yogi fuses with the consciousness that gives rise to the pattern. The fusion is with the subjectivity of the object: knowing by being. The yogi becomes the object, so the external complexity fades behind the subjective awareness. In our internal subjective states we know and control what we are, without any detailed knowledge of our construction. It is like this for the yogi in samadhi. There is no yogi and there is no object, there is a fused entity that is both. The knowledge acquired is that of being the object itself. By being the object, the yogi acts as the object and the object acts as the yogi. It is as intimate an understanding as your understanding of yourself, except orders of magnitude more clear since the exercise of separating out sabda and jnana preceded the fusion with the svarupa. There are no mistaken perceptions in samadhi, just as there is no mistake that you are you and not some other entity. Thus, the yogi knows the svarupa by becoming the object. The yogi accesses artha by acting as the object. Finally is the issue of power. This is the deepest and hardest to express. Artha, power, is a fact of nature at the deepest level. It is an obvious, but very mysterious and ambiguous truism, that some unbelievably extreme, perhaps incomprehensible, form of power generated the universe. The lesson of yoga is that we are directly plugged into this power. It is the same power ultimately, that wells up in the depths of our consciousness and gives light to every moment of existence and nonexistence. That we humans can arrange the thoughts in our mind in such specific ways and release power can almost be taken as empirical proof for the yogic cosmology. Otherwise, without the yogic framework, the whole process is a complete mystery. Why would a bunch of creatures that are proportionately less than a speck of dust in the Cosmos, us human, be able to do what we do with our minds? It simply makes no sense from any other viewpoint. We must be directly plugged into the ultimate power source that created the universe in the first place to be able to release and access such power ourselves. This activity we call science is a set of methods to access this power in a haphazard and disorganized fashion. The activity called yoga accesses the power in a systematic and stepwise fashion. Krishnananda, pg. 37 The Realization of the Absolute. The title of Part 9 is also a Krishnananda quote. Jump to the other parts of What is Science? Part 10 has a surprise shock ending…enjoy! Hi Don, thank you for the amazingly clear exposition– you are somehow also tapping into artha, hence the power we feel coming through your posts. There’s a small typo in the text- ‘visea’– i believe it should be ‘visesa’. With sincere regards. Hello. Thank you for the very kind comment. I appreciate it very much. Thank you as well for pointing out the typo. I found it in the figure, is that the one you saw too? I’ll have to redo the figure.